Thank you for stopping by and chatting with us. We appreciate all the enthusiasm and support for our mission. Last week was such a wonderful opportunity to see all our GC colleagues and friends. Kudos to the GAGC leaders on hosting such a great meeting! We hope you’ll find a way to incorporate the knowledge you gained into your work and stop by ThinkGenetic.com to check out how we’re incorporating it into ours. 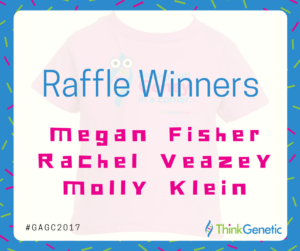 Congratulations to our Raffle winners Molly Klein, Rachel Veazey and Megan Fisher! Didn’t win the raffle? Want to snag your own shirt? Shop our online store to order your own fun shirts and goodies while supporting a great mission. 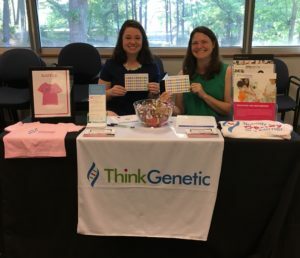 Whether you’re a genetic counselor looking for a little extra pocket change or looking for a new resource for your patients, we are looking to work with you. Contact us to discuss potential opportunities with ThinkGenetic.